It's important to start this section with an understanding that just as our skin tones and hair colours are unique to us and part of our DNA, so too are our body shapes. We are all one of a kind and that should make us feel special and proud to be who we are, we’re not meant to fit into one mould! Embrace your imperfections, own what you’ve got and respect your body for everything that it does, you wouldn’t be here without it. You know your body better than anyone else but you don’t necessarily know it all that well...so let’s figure it out, every lump and bump of it. You’re going to need a tape measure and for best results make sure you’re wearing skin tight clothing or underwear so you can properly admire that beautiful bod. Before you start, and this is very important, stand in front of the mirror, look at yourself, smile and give yourself a compliment! Write down what you love most about your body in your Stylebook. Bust - should be measured in the middle of your bust and tape measure should remain straight right around your back. Waist - to find your natural waist bend to one side and observe where the crease is, this is your natural waistline and the slimmest point of your midsection. Hips - this measurement should always be the widest part of your body below the waistline, therefore it will fall slightly differently for all of us. Stand straight on in front of the mirror with your feet together and observe where your widest point is. 2. Standing straight on in front of the mirror once again, hold the tape measure at one end and create a straight line down your body from the outside of your shoulder. Observe where your waist and hip sits in relation to the line you have created from your shoulder, are they on the inside or outside of the line? Review both steps in your Stylebook and observe how your measurements relate. Which section is smallest and what is the correlation between each section from your shoulder line? Decide which shape below best relates to your findings. Remember these are guidelines only, you may not find yourself fitting perfectly into one...and understandably so, you’re unique remember! If you find yourself fitting into more than one this is completely normal and you should follow the relevant guidelines from each shape when putting together outfits. Oval - Are your bust and hip measurements almost equal? Does your waist sit on the outside of the line from your shoulder? Triangle - Are your bust and waist measurements smaller than your hip measurement? Do your hips sit on the outside of the line from your shoulder? Inverted Triangle - Is your hip measurement smaller than your bust measurement? Does the line from your shoulder sit wider than your waist and hips? Rectangle - Are your bust, waist and hip measurements almost equal? Are your hips and waist mostly in line with the line from your shoulder? 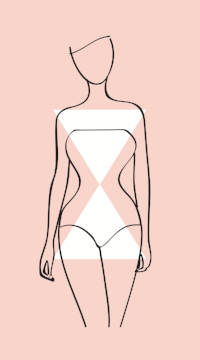 Hourglass - Are your bust and hip measurements almost equal? Does your waist sit on the inside of the line from your shoulder? Knowledge of your body shape is a useful tool but is also impacted by your personal preferences when it comes to the areas of your body you prefer to accentuate and those you prefer to camouflage. The body shape guidelines below are designed to create balance between your upper and lower body and don't take into account your personal preferences. Therefore you should start by thinking about the parts of your body you like to flaunt and those you tend to try and hide. We all have certain likes and dislikes when it comes to our bodies, it's true we can be our own harshest critics, but this is also about you feeling comfortable so that confidence can shine through. Be honest but positive, this is about highlighting your amazing features not hiding everything so go easy on the camouflage list! Use your Stylebook to record your accentuate and camouflage preferences before reviewing the guidelines for your body shape and deciding which resonate with you and help achieve your desired result. Goal - Add volume and width to shoulders, draw attention above bust line and accentuate slender legs. Use details like yokes, boat necklines, wide lapels and collars to accentuate shoulders. Wear detailed necklines and statement necklaces to draw attention above bust line. Design details should sit below the bust and above the mid section or go for more fluid styles to obscure the waist. Use A-line silhouettes in medium structure fabrications to create volume. Wide leg and straighter cut pant shapes will create balance with your upper body. Look for elastic waistlines where possible for better fit and less detail around waist. Goal - Balance out your bottom half by adding volume and drawing attention to your upper body. Broaden shoulders with large lapels, collars and wide necklines. Use bright colours, printed tops and layering to keep the focus on your upper body. Ensure tops and jackets finish above or below the widest part of your hips. Wear receding colours and streamlined silhouettes to help create balance. Stick to styles with minimal design details and soft and fluid fabrications to avoid adding bulk. Wear top hemlines diagonally across your hip area to draw the eye upwards. Goal - Balance out your top half by adding volume and drawing attention to your lower body. Keep detail to a minimum and ensure shoulder lines are as simple as possible. Stick to receding colours and smooth textures. Use vertical design details, seams, darts, open jackets to draw the eye down rather than across. Wear wide leg pants and full skirts to help create balance. Use interesting design details, bright colours and prints to accentuate your lower body. Go for less fitted, relaxed silhouettes like boyfriend jeans or culottes. Goal - Create curves by enhancing your upper body, forming a waist and adding volume at your hips. Use structured, clean lines and details like collars to frame shoulders. Narrow or tonal belts, strategic seam details and gathering or diagonal lines help create a waist. Alternatively, straight or semi fitted styles in more fluid fabrications will help obscure the waist. Balance framed shoulders with flared bottoms and full skirts. Use interesting details, pleats, seams, colour and print to exaggerate proportions. Ensure minimal detail at waist closures or wear tops that cover waistbands. Goal - Frame your balanced body by highlighting your bust, waist and hips. Let design lines like darts, seams and tucks enhance your figure and create a flattering fit. Fit and flare or wrap dresses in fabrications with stretch will highlight your body line. Stick to styles that follow your shape and and fit close to the body. Use high waistlines, tucked in tops, belts and detailed waistbands to help highlight your waist. Ensure pants and skirts are well tailored with a structured design to flatter your shape. Wear styles that hug your hips and mid or high rise cuts to elongate your legs. Armed with this knowledge and an appreciation for your body, dressing should be an enjoyable, purposeful and fulfilling event in your day. And ladies, always remember the key to pulling off any outfit is to wear it with confidence…be proud of your fashion choices and own who you are!